There is plenty of parking for our complimentary valet parking every Friday , Saturday and holidays. Welcome to The Grey Stone Fine Food and Spirits. 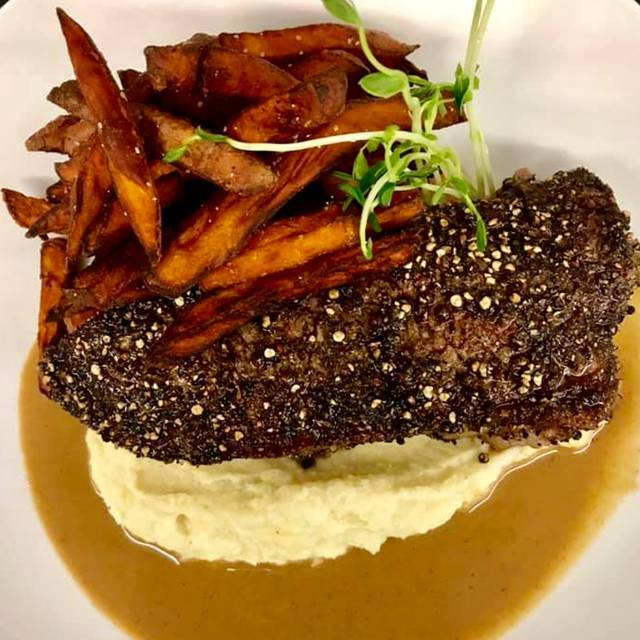 Grey Stone Fine Food and Spirits offers a modern twist on classic comfort foods in a vibrant atmosphere just 3 minutes from Newtown Borough. Featuring a seasonally-changing menu, 24 craft beer options, draft wines and sangria, and a house curated cocktail list all in a newly-renovated space that dates back to the 1707. Experience everything from happy hour, to live music, private dining rooms, a warm and welcoming bar and lounge and an expansive outdoor dining and bar area. 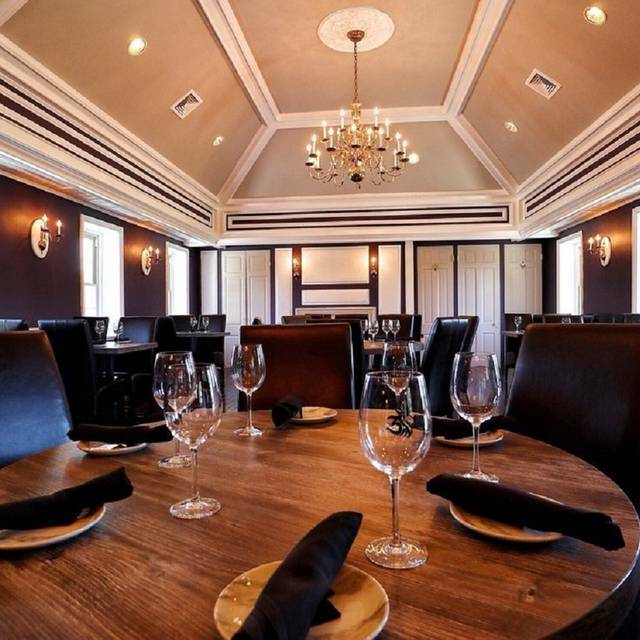 At The Grey Stone we are your destination for all private events and parties accommodating up to 120 guests. We welcome all to join us for an exceptional dining experience. The dinner (veal rib & scallops) were fantastic - never had a better veal chop, EVER, services was perfect not rushed yet not to slow. They also have a pastry chef - so all deserts are made on premise, key for me to order a desert. Requested the chef to pick out a desert for us, we couldn’t choose between several & she selected the Napoleon, it was perfection. pulled pork, pimento cheese, cuban black beans, pico di gallo, bacon, cilantro lime cream $12. I ordered SEARED SCALLOPS bedded on chorizo black lentils, sweet potato puree, highlighted with poblano chimichurri. The 5 scallops were perfectly cooked. $28. House wine: companion enjoyed the chard and I the cab. The new owners have invested wisely creating a moment yet rustic establishment. Loved the atmosphere and the food was delicious!! This was our second trip in a month and our experience was even better this time because we sat in a smaller dining room that was really quiet on a Wednesday night. Everyone liked their food very much beginning with the complimentary bread and sauce brought out at the beginning. The server predicted we would ask for more and we almost did. The entrees were delicious and just like last time everyone in our group was very pleased. Once again the owner stopped by our table which is a real good policy. They were out of several items but overall okay. Dined on Sunday for dinner. WOW the food keeps getting better! Beautiful place we dined outside and it was perfect. Food was ok, but no where near the level it should be for the price. Beer selection was good but they had very little selection in terms of "spirits". There was no permit liquors. Noise level was ridiculously loud, you could only talk to a person right next to you. Wait staff were pleasant and efficient. Greystone is a great place for dinner. Weekday nights are much more intimate than weekends, when there is always good music rock'n the house. Our group of 4 ladies loved Grey Stone. Two of us ordered sandwiches and two ordered the flatbreads. However, while the sandwiches (and accompanying french fries) were very generous, the flatbreads were very disappointing in size, (not in taste). They should have been an appetizer and not a lunch choice. I understand that one flatbread was the pear flatbread and the other was the cheese one. While one friend and I had big sandwiches, we were all shocked that the flatbreads were embarrassing skimpy. We would happily return to Grey Stone, but none of us would order flatbreads again. They actually detract from a lovely restaurant. The only thing was we had an entire room to ourselves. But the best cosmopolitan I’ve ever had. I’ve had many. That 2 people offer was wonderful. We will be back again. Spreading the word. We’ve been there before the other day too. Now happy hour coming. Food was pretty good. The drink were the tiniest pours I've ever seen. Especially the martini glasses. First impressions matter, wine on tap, first time experience, but was a nice wine, I would suggest expanding their wine list further. Our waitress was very attentive but their main special was already sold out, surprising for an 8PM reservation. Ordered three shrimp cocktail and the waitress returned embarrassed that they were out of shrimp, on a Saturday evening, that was disappointing. Food was good and we enjoyed the evening. Leaving at 10PM we would have had another drink but the bar was empty and the band was disassembling their equipment, time to go home, was the message. Maybe 11pm as when we entered the restaurant that bare area was quite lively. Will try again for their outside dining since I was spacious and very nice outside. The highlight was our table service. We came in on a Saturday night. We were sat in the front room behind the lounge. The band was a bit loud. Drinks that weren’t ours. Took too Long for drinks. Our service was slow. 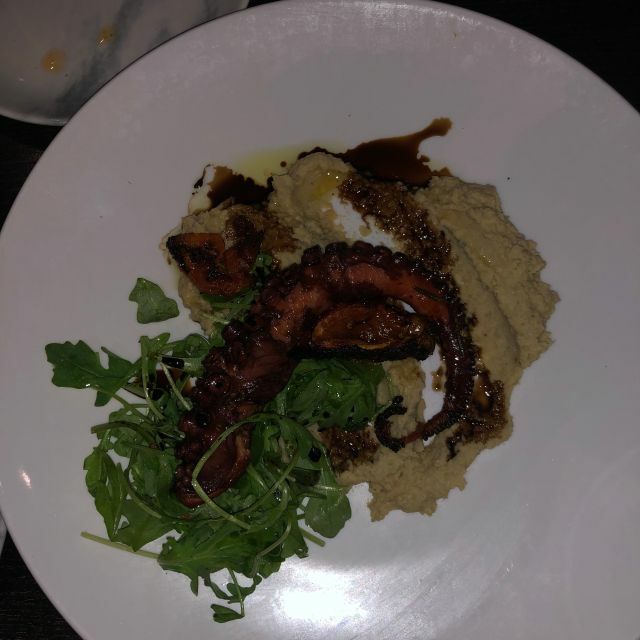 We started with the octopus. That was really good. I had the swordfish and my wife had the gnocchi. The grounds and property are beautiful. Celebrated two birthdays on Saturday, March 30th at The Grey Stone. Every aspect of our experience was wonderful; from being met by the complimentary valet; the accommodating hostesses; our bartender Mika - who made fabulous appetizer suggestions and made us lovely beverages to start off our evening...to our meals which were absolutely delicious! The ambiance, decor, music and service was exceptional. Looking forward to experiencing the outside patio once it's open for the warmer weather. Rest assured....we'll be back! Food is excellent! Slow cooked beef short ribs were awesome! Pitachio cheesecake was great! Very unique. Never saw that anywhere else. Very nice ambience. Bar was crowded and there was a band. Great for dinner and then drinks and entertainment at the bar. Second time there. Will definitely be returning soon. Very nice atmosphere but we were not impressed with the drinks and quality of the food. A friend and I went to hear a favorite band of ours In the Groove. I made dinner reservations but when we got there we noticed two seats at the bar which we preferred. The bartender, Jamie, was very good and attentive. My friend and I, even with the music playing, were still able to talk without shouting. Everyone, including us, was having a good time. The crowd is friendly. We ordered a special Sangria they had for the evening that was delicious, the fried calamari (maybe a little over cooked but good just the same), and the hummus platter (also very good). I would recommend it. As a matter of fact we are taking other friends there this coming weekend. I understand when the weather gets warmer they open up the patio so I"m looking forward to going back. I looked online because we were looking for reasonable dining options, and we knew that a new owner had taken over. The online menu had reasonably priced apps, salads & sandwiches. It was Friday night, there were 4 of us and we were I. The mood for burgers. Unfortunately, we found out that you can’t order from the Casual menu on Friday and Saturday. They did tell us that there was 1 high end burger(Wagyu) that we could get. This burger is $22. Two of us ordered the burger. Honestly, it wasn’t even that good. I’ve had great burgers of $17/18. But that’s beside the point. It happened that the mgr. stopped at our table to ask if we were alright. We told her we were disappointed that we couldn’t order off the casual menu, and she explained their philosophy, which made no sense. The restaurant was 2/3 empty on a Friday night. That says that there is a problem. The other thing that bothered us was my friend ordered a martini. It didn’t come in a martini glass. It came in a shallow champagne glass. We don’t think it was more than 1/4 cup of liquid. And it was $12. You need to know we go out at least 4 nights a week. We go to all kinds of restaurants, at all price points. Great building with a lot of bnb potential! Was pretty empty for a Friday night bhut it is St. Patty's Day weekend. Food and drinks were good but on the expensive side. Would lije to try it again when the outside is open. Our third experience there, and it was again wonderful. Looking forward to returning again soon! Food was very good and timely. Service was very good. Very disappointed in the seating situation. We had a table with 2 chairs and 2 seats on a banquet bench. The bench is so high that are wives looked down on us the whole time. Tried to move but we were told there were no other options. One of the most bizarre and awkward setups I’ve experienced. Very disappointing. Previous restaurants at this location never seemed to make a go of it. I hope Grey Stone survives. We were very surprised at the great decor, cleanliness and staff. Lower dining room offer various seating options side benches, darker booths and center of room tables with the right amount of lighting. Good wine list. Wild mushroom ravioli was well sauced and flavorful. Steak and lobster combo had moist lobster with a nice sized filet that was cooked as ordered. Staff was helpful and not intrusive. We were glad to give this a try. They had complimentary valet parking on Saturday night. Absolutely one of our favorite places in the area. The menu is creative and has truly wonderful offerings. There is something for everyone. Our favorites: the short ribs and scallops. And the mushroom risotto is to die for. The wait staff is friendly and extremely helpful. First time here. Loved it. I had heard from a few people it was good so we finally decided to try it. I'm sorry we hadn't tried it sooner. The menu has something for everyone and a few creative dishes as well. Our server was attentive and great at suggestions and explanations. Even the "wines on tap" were a pleasant surprise. I had a buffalo cauliflower Caesar salad. Delicious! Everyone enjoyed their dinners and cocktails. We will definitely be going back to try other things on the menu. We have not been back to this place since it first opened. The food was very good and the specials for 2 on Tuesday and Wednesday nights are great. Service was a little slow, but they were very friendly and the food was very good. We will go back more often. Everything was excellent! Bar and lounge area was so nice with fire place. We sat in the romance room, very cozy with another fireplace. We shared the fried goat cheese appetizer that was delicious followed by a pear flatbread, fig jam burger & octopus. Menu had something for everyone. Service was great. We will definitely be back! Grey Stone is a good restaurant. The food was very good and exactly like what was described on the menu. The service was very good. They had a band by the bar and it was very loud even though we sat in the far room. I would definitely go there again. Had an awesome experience and the food was delicious. The bar is small but there is seating available in the bar area. Strong smell of cleaning solutions while sitting at bar. The dining room we sat in was so noisy we could not hear conversations at our table. The table next to us was very loud but the room does not have any barrier to absorb sound in the room. Tried to move to another dining room but was not available. We wanted to leave but are food arrived so we left as soon as we finished. Was looking forward to a enjoyable evening with are family from out of town but was very disappointed with the whole evening. Food was fine . I would let friends who would want to try to request a quite area and to sit in bar area and not at bar due to the smell. No complaints, but food was ok, not great. Prices were reasonable. Loved it and will be back again! Great food, service! New Fav place! Great ambiance, delicious food, friendly staff. Live music and great bar! The restaurant is beautiful. However, it is not inexpensive for lunch. There is really nothing unusual or special about the food served. For example, a burger with fig ham sounds interesting, but burger was cooked longer than medium, plus you could not taste the fig jam. Cocktails are between $12 and $14. I had a winter white margarita which was not tasty at all. The handcarved turkey with arugula, cranberry and Brie, while sounding good, was not great. However, the French fries were delicious. I would not return. We wanted to have an early dinner and made a 4:30 reservation but they were still serving lunch so we waited until 5 for the dinner menu. Service was slow. Waitstaff was not very attentive. Food was very good though. Food and decor were outstanding! The noise level was extreme. Great priced wine list. The rack of lamb was prepared to perfection. Would like to try the other dining room next time maybe not so loud. Excellent staff, good food at a reasonable price. Nice, clean facility, not so much a place for a special occasion or romance, but fabulous for everyday dining. Open floor plan, can be a little noisy when very busy.